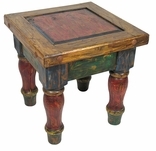 Unique Collection of Mexican Painted Tables, Bars, Benches and Hutches. 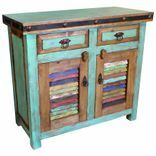 This line of colorful Mexican country style furniture is made of reclaimed wood and new wood with as little of the new as possible. 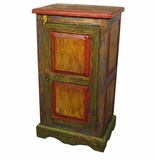 Hand painted with a color washed look reveals streaks of the wood's natural color under the overlying paint. Imperfections make it perfect for the lover of old and new. Each piece is unique and will add Mexican countryside charm to any room. 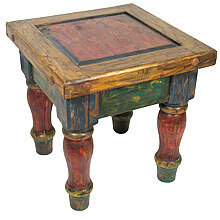 This handmade furniture is perfect for a rustic log cabin, western ranch or any southwest or old Mexico decor. 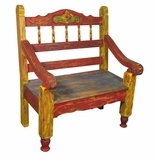 Many of the items you'll find in our Mexican painted furniture section utilize beautiful rustic iron hardware including drawer pulls, hinges and rustic nailheads. The designers of these pieces have combined these elements and created truly unique items for any rustic, southwest or ranch decor. IMPORTANT NOTE: Each piece is a unique rustic creation. Expect slight variations in size, wood texture, distressing, color and hardware elements. The furniture piece you order will not be an exact match to what is shown. Click on the old wood sections below to see all the unique pieces offered.